Medieval Mode. You’ve heard of it. Sounds awesome. The Wiki page makes it look awesome. But is it awesome? Ignore the haters, this mode is great. I can have a barrel of fun on cp_degrootkeep (and a lot of custom Medieval maps, but those are way harder to find people playing.) As almost any class. Medieval Mode gets a lot of flak from most because it’s considered a “melee spamfest”, “void of all strategy” and “a horrific cluster♥♥♥♥ of arrows and demoknights.” And they may all have a point. But there are ways to play the game mode strategically and aid your team in winning the round on a consistent basis. Scout: Mad Milk/Candy Cane– I see the Sandman/Cleaver scout all the time, and while that loadout is fun as hell, it’s not nearly as effective as Mad Milk/Candy Cane. The candy cane is a straight upgrade in Medieval: the only explosive sources (Kamikaze and Ullapool Caber) will already kill you, and enemies drop two health kits when they die. PLAYSTYLE: Milk dispenser. Sprint from spawn to the contested point, fling a Mad Milk at it, and sprint back to spawn. Use melee only to get a weakened enemy out of your way. Your milk is the thing that’ll win battles for your teammates, and you don’t have the damage output or survivability to do much more than this. But your role heals the entire team. Soldier: Buff Banner/Disciplinary Action– No other melee should ever be used. The whip is the best melee weapon in Medieval for any class, bar none. 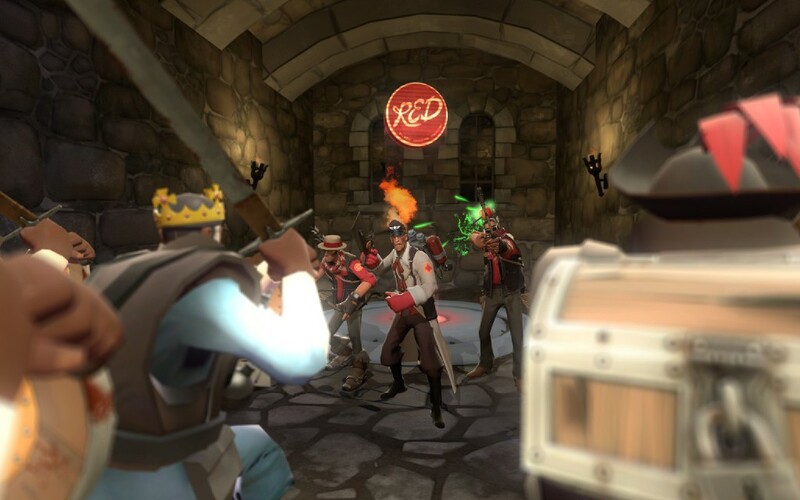 It has a longer range than the demoman swords and deals random crits, meaning YOU are the demoknight counter everyone thinks doesn’t exist. Also you can speed up teammates, which gives them a significant edge in combat. All three banners are viable; Buff Banner is easiest to build up and helps your whole team plow through the defense, Battalion’s Backup negates random crits and headshots for crazy survivability, and Concheror…helps a little? I guess? Use one of the others, I haven’t found the minor healing and speed boost worth it. PLAYSTYLE: You are the Ubercharger of Medieval Mode; behave like a Medic in regular play. Play conservatively; stay near spawn and let enemies come to you and your allies. Build up your charge while you have the advantage and an escape route. Save your Banners for either the final push on the castle (if BLU) or for negating the next enemy push on your castle (if RED). Regardless of what side you’re on, during a castle push the team with the Buff Banner wins. Demoman: The Pain Train– Remember the scout playstyle I described above? You notice he’s not doing his normal job of capping points? That’s this guy’s job. There are enough demoknights running around with swords on the field already; Getting one that can cap the point crazy fast is worth way more. You have all the same survivability standards of a normal demoknight, except you deal random crits and have a slight weakness to arrows and shields (they deal bullet damage for some reason.) This is the best demoman for winning the game and helping your team. PLAYSTYLE: If the outside points are uncaptured, get to them as fast as you can. If you are the first there from either team, it can be halfway capped before anyone else even gets involved. If the castle is the last remaining, rock jump up to the parapets and try to sneak around the back. Obviously a traditional demoknight is better on defense. PLAYSTYLE: Clairvoyant sniper. Stay near (but not on) the front lines and look for enemies who can be oneshot with the crossbow. Then oblige them. On defense the castle walls is best for this, and on offense peeking over the hills at A or B can do a lot of good. Getting rid of those red-health pests can really clear up a point for your teammates. Engineer: The Eureka Effect– This one is a little tongue-in-cheek, I admit, because the engineer has no real role in Medieval and should never be played. However, I thought I’d take this opportunity to explain why this is the best wrench for the mode. Obviously, it’s better than stock because it has no downsides, and here’s why the Southern Hospitality and Gunslinger aren’t the best wrenches for the mode: their jobs are fulfilled better by other classes. Tribalman’s Shiv snipers are just S.H. engineers with bow-n-arrows; and Pyros are just Gunslinger Engineers with random crits, +25 hp and afterburn immunity (Even the glitched guaranteed crits only get me maybe one kill, then you don’t have teammates to punch). The Eureka Effect fills a role that no other class has; (the Engineer that can overextend and get back to base safely when things go south) and while this role isn’t useful at all, it is unique. No other class can replicate it. TL;DR These classes are just as viable as the classic Medieval ones, they just excel at a different team-oriented playstyle.